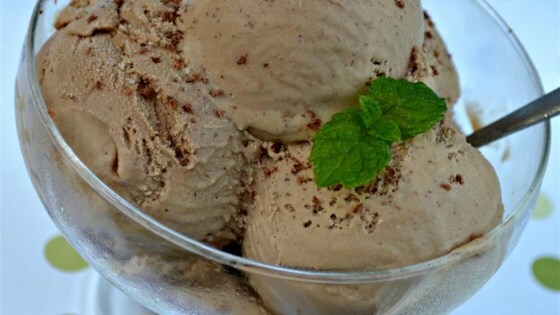 "A wonderful hazelnut- and coffee-flavored gelato I created after coming home from a trip to Rome a few years ago." Combine milk, cream, and 1/3 cup sugar in a saucepan over medium heat; cook and stir until sugar dissolves, 3 to 5 minutes. Beat egg yolks and 1/3 cup sugar together in a bowl until mixture is light yellow, about 4 minutes. Stir 1/2 cup milk mixture into egg mixture until smooth; pour into the remaining milk mixture in the saucepan, stirring continuously. Cook, stirring continuously, until mixture thickens enough to coat the back of a metal spoon, 8 to 10 minutes; remove from heat. Stir chocolate hazelnut spread, espresso powder, and vanilla extract into milk mixture until well combined; pour through a mesh strainer into a bowl. Refrigerate mixture until cold, about 3 hours. Pour milk mixture into an ice cream maker and freeze according to manufacturer's instructions. For a thicker consistency transfer ice cream to a glass dish, cover, and place in freezer. I did not change a thing. Tasted awesome. Smooth and creamy. Will definitely make it again.